As the new school year is just around the corner, it's a great chance to commit to making learning more effective and meaningful in your classroom or school. Here are five challenges to make it the best year ever. Everyone can make it a point to greet students at the door each day. But it's also easy to get busy with other things and neglect the doorway greeting. It's easy to get pulled away by paperwork or visiting with colleagues or other things. That's why I decided to include this as a challenge. It's a challenge for me too. I always try to greet students in the morning, either at one of our entries or by mingling in the hallways. But sometimes I let other things get in the way. I want to commit to make this a top priority all year long. It shows students you care and want to interact with them. It allows you to read students' body language and see how they're doing, if they're ready to learn. It earns buy-in from your students and motivates them to engage in your classroom. 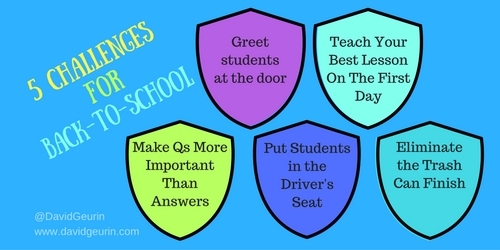 You might be surprised how much difference it makes when you make greeting students a top priority. I think it's fair to say there is too much teacher talk overall in K-12 classrooms. Learning would be better served if students were more actively processing content and skills instead of so passive receiving. And that's and every day concern. But is there any school day with more teacher talk than the first day of school? Teachers talk about the rules, the procedures, grades, the seating chart. We talk about the syllabus, about the class objectives, and more. I remember a teacher who even discussed at length the organization of the textbook. Really? Why would we want the first day of school to be the most boring day of the school year? Shouldn't we want students to actually be excited about returning to school for the second day? I think the first day should create enough excitement and intrigue that students are more excited about learning tomorrow than they are today. I recently read that we tend to make first impressions of people we meet within the first 7 seconds and then spend the rest of the conversation trying to convince ourselves why our impressions are true. I'm betting that's true in the classroom, too. Your students will make assumptions from the first day that may be hard to change later. So I'm suggesting you try to teach your best lesson on the first day. Make it so great that students will be rushing to your class for day two. Don't talk about all the boring rules and procedures on day one. You can communicate all that stuff a little at a time the first few weeks of school. Some of it you can address as teachable moments arise. I understand the importance of rules or procedures, but don't start the year with that stuff. Instead of the boring pitfalls of the first day, here are some alternatives. Challenge students with a problem. Have them work in groups to create something. Use a team builder to get students active. Here is an Epic List of Team Building Activities. Use Brain Teasers to get your students thinking immediately. Here's another set of Brain Teasers that might be a little less challenging. You might even be able to use the brain teaser to illustrate something about your rules or procedures, if you are determined to squeeze some of that in on day one. Another possibility would be to jump right into your content. Have students read something interesting and even mind-blowing from your subject. Have a discussion about it. Get everyone talking and sharing as much as possible right from the start. 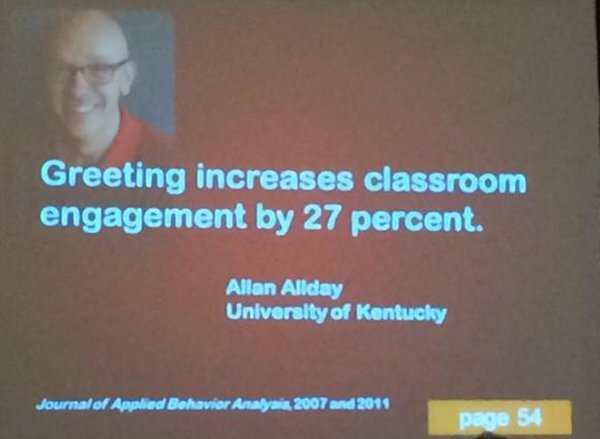 Set the stage for high levels of engagement on the first day. And another possibility, I would always do this when I was teaching high school English. I would tell my students on the first day that I was going to learn everyone's name, today. I had six classes with nearly 30 students per class. So this was always a big risk. It's tough to learn 180 names. And I always failed. But I would try. And I would learn most of the names on the first day. Think of the lessons that flowed from this. The kids were interacting with me. There was suspense. They couldn't wait to see if I would remember their name on the next cycle through the class. It was a great chance to talk about taking risks and failing forward. We would laugh together at my mistakes. I also did this to emphasize the importance of relationships. I try to learn your names because I want to get to know you. Whatever you do, make your first day memorable. Try to teach your very best lesson! I'm guessing many students have come to believe that success in school is closely tied to delivering right answers. And if you deliver enough right answers you get a good grade. But this type of learning doesn't necessarily stick. Students will deliver right answers on the quiz or test that is right in front of them, but what about months down the road. Do they still retain much of that information? I'm guessing no. But focusing more on questions can lead to deeper understanding. And when students have deeper understanding, the learning tends to stick. It helps with applying information, seeing the big picture, and transferring learning to new contexts. Questions are the foundation of all inquiry. Physicist and Nobel Laureate Richard Feynman said, "There is NO learning without having to pose a question." But not all questions are created equal. Many questions are asked in the classroom that do not generate deeper thinking. These questions are the ones that seek a single right answer with very little explanation of thought. But my challenge is to make a shift. 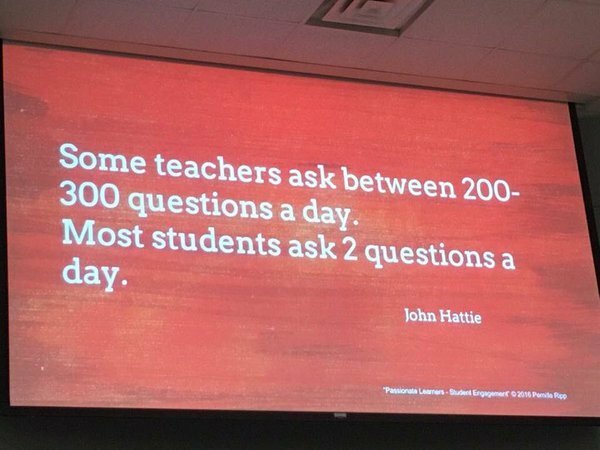 Try to make your classroom more about questions than answers. Whoever is asking the most questions is doing the most learning. Students should regularly develop their own questions. The most interesting questions don't have one right answer. The least interesting questions are those with straightforward, factual answers. Use questions to help reveal and uncover your students' thinking. A right answer doesn't provide any clues to how the answer was achieved, unless there is elaboration and explanation of the thinking. Curiosity fuels learning, and questions build curiosity and give curiosity an outlet. A couple of years ago, we asked our students to select schoolwide essential questions to guide inquiry across all subjects. Our students actually voted on the questions. 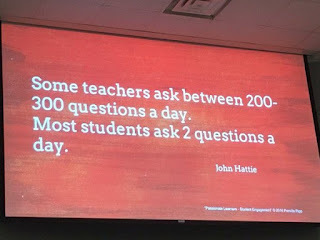 We had one question each quarter of the school year. You could do the same thing in your classroom or school. 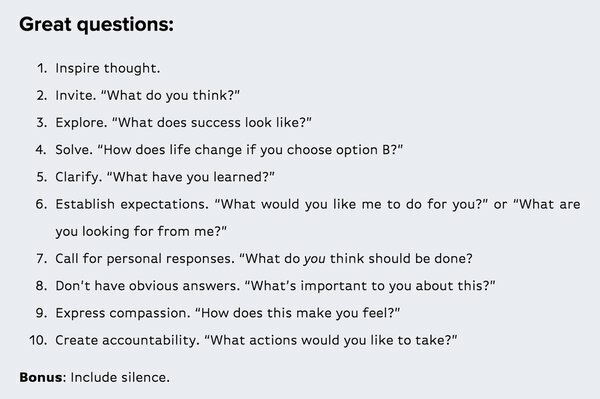 Here's a Giant List of Really Good Essential Questions. If our goal is to create independent, lifelong learners it's important to create classrooms where students are taking greater ownership of their learning. We know that a student-centered classroom is more effective than a teacher-centered classroom. 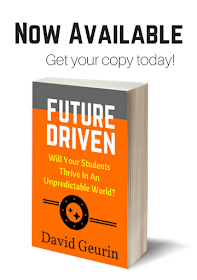 So how can you put your students in the driver's seat this year? Our school went 1:1 last year with Chromebooks for every student. Many in our community probably thought this was about keeping up with technology. But the greatest benefit to every student having a device is student agency, the ability for each student to make some of the decisions about the direction of their learning. Access to a device and consequently access to the sum of human knowledge via the internet creates opportunities for empowerment. But we can't keep teaching the same way and expect empowerment to increase. Just giving a student a device will not lead to empowerment. We have to give up some of our control and help guide and facilitate learning instead of making every decision ourselves. Here are some questions for you to consider about agency and empowerment in your classroom? How often do students have input on how they will learn? How often do students have input on what they will learn? 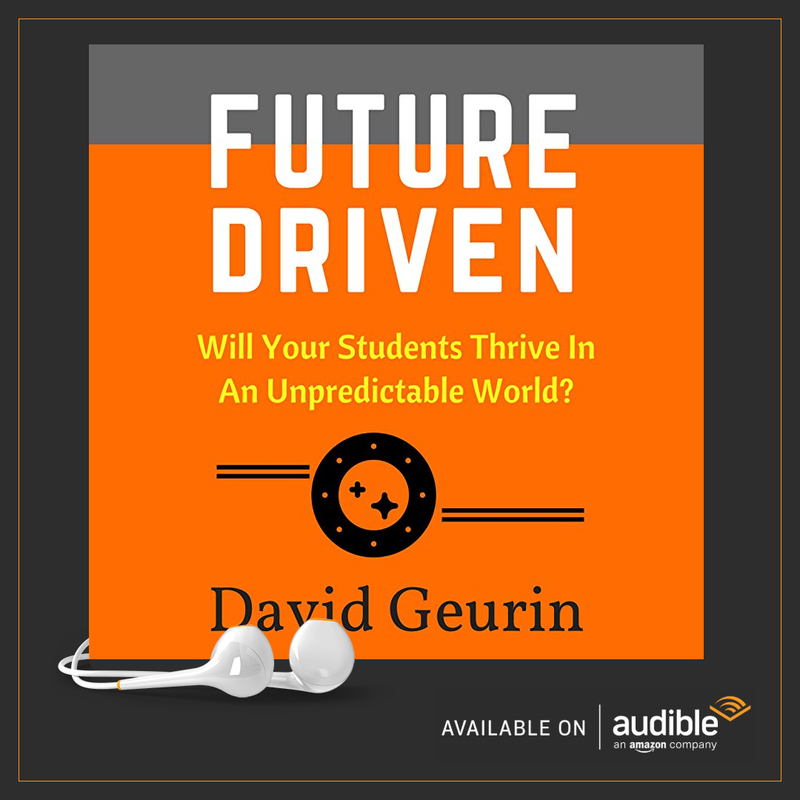 Are students given opportunities to lead conversations? Are classroom goals developed by the teacher alone or in partnership with students? Do students have some time to pursue their own goals? How often do you ask students for feedback on their experience in your classroom? In classrooms where student ownership has flourished, I've noticed that it's usually because teachers really listen and spend a considerable amount of time understanding their students' perspective, what's important to them, what their experiences with learning have been in the past. There is a feeling that the students and the teacher are co-creating the classroom together, instead of the teacher delivering lessons. Where does most student work ultimately end up? Unfortunately, most of it is destined for the trash can. It will never be shared with anyone beyond the classroom. The teacher will review it and assess it, and finally it comes to rest in a landfill. Sometimes, the work will be shared with other students in the classroom. But why aren't we seeking more authentic audiences for student work? When students know their work will be shared with a real audience, it changes the mindset. Instead of just producing work that is good-enough to get the grade, they will want to produce work that represents their best efforts. The sense of audience is an opportunity to practice empathy and try to see the project through the end-users' eyes. It's what professionals do in their work all the time. Our students need to be practicing the skills that all people use when they are completing a project or developing a product that will no doubt be presented to a real audience. And there are more ways than ever to share student work. With social media and other digital platforms, student work can be shared across the world. Students can create blogs, produce podcasts, or compile digital portfolios. Twitter is a great way to share out links or images of student work. The #Comments4Kids hashtag is one great way to connect with audiences and get feedback too. 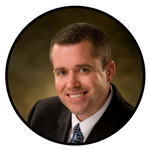 According to a Forbes magazine article, your online presence will soon replace the traditional resume. But most students haven't done anything intentional to establish digital presence or personal brand. Your classroom could help change that. You can find ways to share student work so that their great ideas and best efforts can be accessed in the present and the future. Besides digital sharing of work, there are other ways to make learning visible and include real audiences. Elementary schools are great at displaying student work throughout the school. Why don't more secondary schools do this? One idea a teacher developed in our school invites professionals in our community to examine student projects. It's kind of like Shark Tank, with students pitching their ideas to a panel of "sharks." Schools can also have maker faires or other showcase events where student work is on display for parents and community. Avoiding the trashcan finish can be as simple as a Tweet or as complex as a schoolwide fair. Everything students do can't be shared out, but we need to start sharing more. It brings relevance to learning and allows kids to contribute ideas and products to the world right now. Students shouldn't have to wait until they are out of school to make valuable contributions. Question: Which of these challenges will you try this year? Let me know what you think. Leave a comment below or respond on Twitter or Facebook.